Sateen Releases Music Video For Queer Love, Anti-Trump Track "Love Makes the World"
NYC musician/performance artist Sateen, with her partner and collaborator Exquisite, has released a perfect antidote to Trump assuming power tomorrow: love. 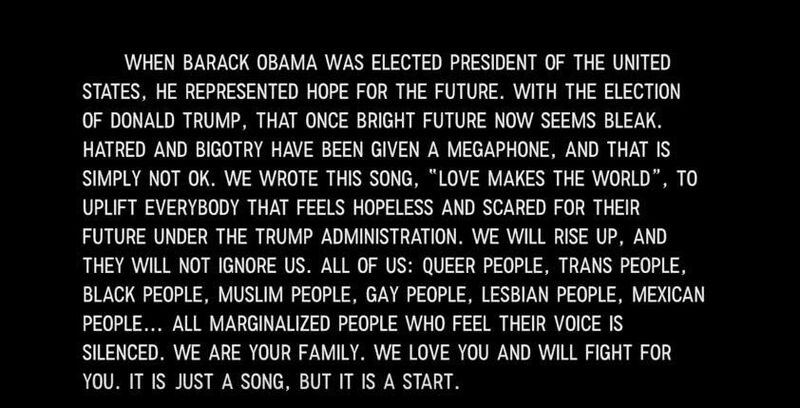 Specifically queer and LGBTQ love, in the form of a music video for her equally shimmering track 'Love Makes the World," which rails against the oppressive wave of ultra-conservative fascism that's taken hold of our country, and the rest of the world. "The whole world is hurting," Sateen coos. The clip--directed by Matt Sparks--for the blissed-out, ambient dance track features a slew of queer and LGBTQ nightlife personas and artists from NYC and around the world, like Amanda Lepore, Violet Chachki, Rify Royalty, Merrie Cherry, Will Sheridan, Sussi Suss, Love Bailey, Edward Vigiletti, Aquaria, and Ryan Burke. Watch below. Love Trumps Hate.